How do tiny bugs get into oatmeal? What makes children look like—or different from—their parents? Where do rotten apples go after they fall off the tree? 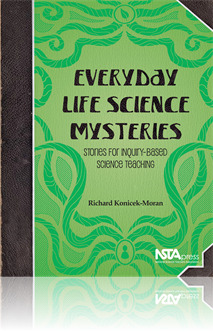 By presenting everyday mysteries like these, this book will motivate your students to carry out hands-on science investigations and actually care about the results. These 20 open-ended mysteries focus exclusively on biological science, including botany, human physiology, zoology, and health. The stories come with lists of science concepts to explore, grade-appropriate strategies for using them, and explanations of how the lessons align with national standards. They also relieve you of the tiring work of designing inquiry lessons from scratch. This book has everything an elementary classroom teacher could ask for, all in one place, when planning and organizing science materials that will engage students while fulfilling the requirements of science standards. ... An elementary teacher could not go wrong having a copy of this book available when developing lessons to illustrate the big ideas and literacy connections now being required as science is integrated with the Common Core.